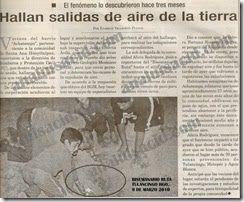 Locals reported the phenomenon to the authorities, who in turn advised journalist Fernando Pérez of the NQ News Broadcast. The air is cold and is expelled with great force. Residents of the Achatempa District, attached to the community of Santa Ana Hueytlalpan, advised the Fire and Civil Protection Department (PC) that three holes -- from which cold air is expelled with considerable pressure -- were found on their arable land. According to the answer received from the SGM, a team of specialists will reach the site today (Tuesday, 03.10.10) to make the corresponding investigation. Alicia Rodriguez, deputy delegate of the community, led reporters from Bisemanario Ruta to the site where the three holes are located. She pointed out that while they are located on cultivated land, it is a trail used by those who live nearby. She explained that Mrs. Fortuna Romero became aware of the phenomenon on January 23rd, but just as she was getting ready to report it, the holes stopped producing air and it wasn't until yesterday that exhalations were reported. Elderly residents of Achatempa recall that approximately 27 years ago, a water well was dug in one of the highest areas of the community in the hopes of supplying the surrounding region. However, the well only functioned for half a year and then began to expel air. Alicia Rodriguez mentioned that the phenomenon caused such a sensation that over 70 people had come to the site from Tulancingo, Metepec and Agua Blanca. She advised that local residents shall be alert to the progress of the investigations and expert inquiries for the community's own peace of mind. related to the February phenomenon, involving the alleged crash of an object or meteorite on the border between Hidalgo and Puebla. "I'm inclined toward the possibility that the air is entering through a cave and emerging through the holes, as there are some caves in the area. Of course, the explanation will be provided by experts, especially since the Mexican Geological Service has been advised. "The air is cold and comes out with some force, as though propelled by a fan. Sometimes there is noise. I recorded it with my cellphone and played it on my newscast. The phenomenon is very intriguing. I'd never heard of such a thing." Comment by Ana Luisa Cid: While this news item appears to be foreign to the main subject of this blog, I think its important to make it known. What is going on in Hidalgo? Is it true that there is no link to the explosion heard last month? Many thanks to Lic. Fernando Pérez Rodríguez for his attention and courtesy in allowing us to present this exclusive video on Mexican television.